API Service Classification SN PLUS, Resource Conserving; ILSAC GF-5. GM dexos1 Gen 2 compliant. Supreme 9000™ Full Synthetic 0W-20 engine oil provides extra protection during stop-and-go driving conditions and is recommended for gasoline fueled automobile and light duty truck engines (including turbocharged and supercharged engines). Our fully synthetic 0W-20 is a multi-grade oil gasoline oil engineered with the finest quality of synthetic base oils, an advanced performance additive package and a viscosity index improver. This unique blend creates a premium, longer lasting oil that withstands a higher heat range than conventional oil. Using proprietary friction modifiers, Micron Moly® and Penetro®, Supreme 9000 Full Synthetic 0W-20 quickly plates to metal surfaces, creating a slippery, tenacious shield that prevents metal-to-metal contact. By reducing friction and wear, Supreme 9000™ Full Synthetic 0W-20 protects critical engine parts and increases engine efficiency, engine life and fuel economy. Supreme 9000™ Full Synthetic 0W-20 keeps engines exceptionally clean and free from oil residue and sludge, allowing the oil to flow freely and lubricate properly. 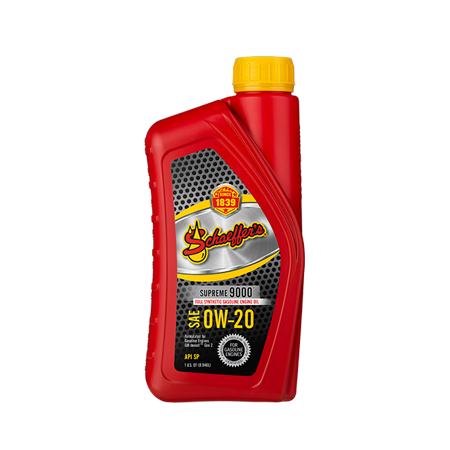 For extra protection in cold weather, our 0W-20 full synthetic oil offers superior cold cranking and oil pumpability at low temperatures.